Cost to remove popcorn ceiling texture varies greatly by region (and even by zip code). Get free estimates from paint removal experts in your city. Cost to remove popcorn ceiling texture varies greatly by region (and even by zip code). Get free estimates from paint removal experts in your city. How much does it cost to remove popcorn ceiling 1 texture? 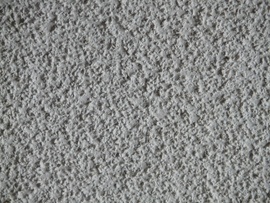 Popcorn ceiling 1 is a cottage cheese-like texture applied to ceilings that was popular from the 1950s to the 1980s. The texture is fairly easy to apply and has natural acoustic properties and it easily to covers imperfections in the ceiling. However, it has been linked to asbestos 2 and is generally not a technique used in modern construction or remodels. Popcorn ceiling 1 removal can be a DIY project, but hiring a professional is always recommended. 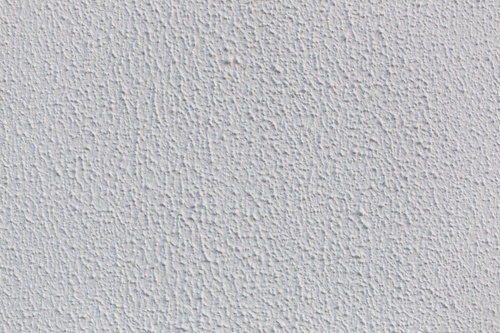 For this discussion, we will consider the costs of removing popcorn ceiling 1 in a 10'x10' room with minor issues, which averages between $700 and $1500. Simply patching or repairing popcorn ceiling 1 can be difficult and expensive, so it is usually worth simply removing it instead of repairing it. Another reason to remove popcorn ceiling 1 is that it is commonly viewed as an outdated design practice that can date a home. The walls and floor of the room are covered with plastic sheets, removing popcorn ceiling 1 is a fairly messy process. If the popcorn ceiling 1 was installed before 1977, a small section of the popcorn ceiling 1 is tested for asbestos 2 (for an average cost of $50-$100). The ceiling is sprayed with water in sections (the ceiling area around fans or fixtures shouldn’t be sprayed with water because it can damage the fixture and cause electrical issues. For these areas, it is better to use sandpaper to loosen the popcorn ceiling material). Once the water has been absorbed into the popcorn ceiling material, it is scraped off. After all the material has been removed, the ceiling is smoothed and made even. Plaster popcorn ceiling 1 would be removed with the same process. A water sprayer, plastic sheeting, drop cloths, and scrapers, typically average $50-$100 for a 10’x10’ room. Most professionals charge based on the square footage of the ceiling instead of an hourly labor cost. The average cost per square foot is $1-$3 depending on the size of the room, the quality and age of the popcorn ceiling 1, and if there is paint and/or asbestos 2. In general, materials cost are included in the square footage price. Adding a detailed texture to the new ceiling can cost $200-$250. A basic paint job on the new, smooth ceiling averages $75-$125 professionally. Another option instead of scraping off the popcorn ceiling 1 is to cover it with drywall 3. 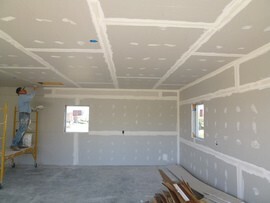 This process eliminates much of the mess of the project, but does lower the ceiling of the room. The cost of drywall 3, nails, and a stud-finder for a 10’x10’ room averages $140-$200. All furniture needs to be removed before popcorn ceiling 1 can be removed. In most cases, homeowners can do this themselves. If professionals move the furniture, it will add $75-$125 to the total cost. Rooms with high ceilings can cost an additional $50-$150 depending on the height of the ceiling. Painted popcorn ceiling 1 takes much longer to remove because the water doesn’t saturate into the ceiling as quickly. In some cases, the “wet and scrape” process must be repeated three to five times. For non-enamel painted ceilings, plan to add $150-$250 to the total cost. Enamel-painted ceilings add $300-$600 for a 10’x10’ room. If asbestos 2 is found in the popcorn ceiling 1, you have two options: leave it alone or remove it. Leave it: asbestos 2 only becomes harmful if it is disturbed and the fibers enter the air; if your popcorn ceiling 1 is in good condition and it won’t be bumped or nudged to disrupt the asbestos 2, you can leave it as is. You can also spray paint it to add a protective layer against the asbestos 2, but that may make it harder to remove the popcorn ceiling 1 if you decide to later on. Remove it: removing popcorn ceiling 1 with asbestos 2 adds an extra step in the process and cost. Homeowners can legally remove their own asbestos 2 popcorn ceiling 1, although it is definitely not recommended. Your best bet is to hire a professional who is experienced in asbestos 2 popcorn ceiling 1 removal. Everyone working on the project will need to wear protective clothing and masks at all times, and the homeowners may need to leave the house while the project is being completed. You’ll likely need to file a report with your local community office. Removing popcorn ceiling 1 with asbestos 2 also takes longer because you will need to dispose of the popcorn ceiling 1 in batches. In general, removing asbestos 2 popcorn ceiling 1 costs $3-$5 per square foot. How much does it cost to remove popcorn ceiling texture in my city? Cost to remove popcorn ceiling texture varies greatly by region (and even by zip code). To get free estimates from local contractors, please indicate yours.